Let’s learn about traditions from Western Africa and the people who make communities strong. What do you think this is? 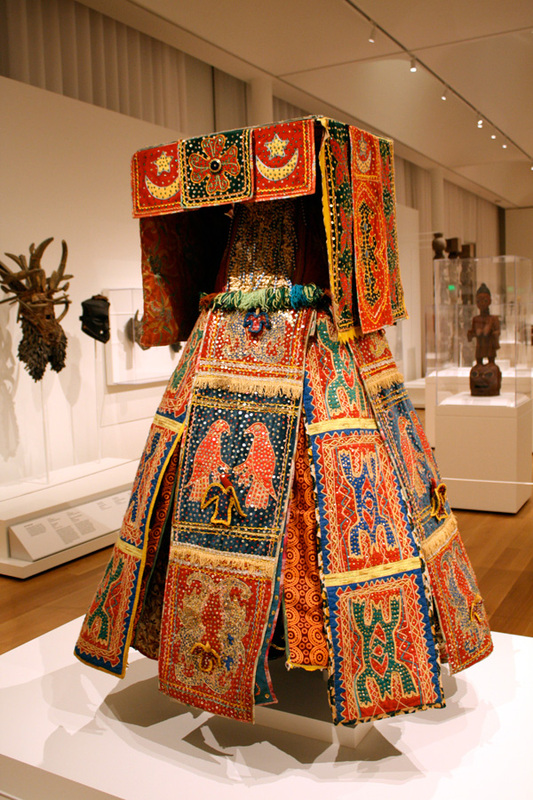 It is a costume made by Yoruba artists from Benin in West Africa to practice and enhance their community’s beliefs. A member of a family would wear it during a festival to honor his ancestors. Who are ancestors? Ancestors are family members who lived a long, long time ago. Families in this community believed their ancestors watched over them and knew who in their community was good and who was bad. To summon the power of their ancestors and seek their guidance, family members would wear costumes like this in a dance. What is it made of? It is made of many layers of different types of cloth in many colors, textures and patterns and is adorned with beads, coins, cowrie shells and sequins. The beautiful materials that make up this costume were imported from other countries and were expensive and rare. This tells us the family who owned this costume was successful in their community. Eye-spy the different patterns and colors. Do you see any images of animals? There are birds. In general, birds represent the spiritual powers of elderly women in their community. Birds also refer to one of their beliefs that a chicken scratched the ground and created the earth. “In the beginning there was only water, a primeval ocean. The Supreme Creator, Olodumare, decided to make the world out of this water. The eldest spirit of all the spirits, Obatala, was given the task of creating the world. Obatala descended to the watery surface from a long chain. In his hands was a hollow gourd full of rich soil and a chicken. When Obatala reached the watery surface, he quickly sprinkled the rich soil from the gourd and dropped the chicken on top of the soil. The chicken ran around and around, all the while kicking and scattering the rich soil in every direction. Soon a crust was formed. Obatala then made palm wine from the palm trees he caused to grow and began to drink the wine. He fell into a drunken stupor. The Supreme Creator saw that Obatala was drunk and sent Obatala’s younger brother, Oduduwa, down to the surface of the world to finish the task. Do you wonder how this costume was worn? A person would step inside and balance a wood panel on top of his head. The many strips of cloth would hang from this wood panel. He would look out through a hand-knotted cloth that would cover his face. He would be dressed in a dark clothing so no one could see him. He would perform an acrobatic dance, including rapid spinning, which would cause the strips of the costume to fly out away from his body in a display of color and pattern. In his dance the power of his ancestors would appear. Have you ever worn a costume? When you wore a costume, how did it make you feel? This costume was handed down within a family from generation to generation. Are there any items that belong in your family that remind you of your ancestors? Do you have anything that was handed down to you from your ancestors? Perhaps you have seen quilts filled with feathers or cotton and stitched together in lines or patterns and used as bedcovers. 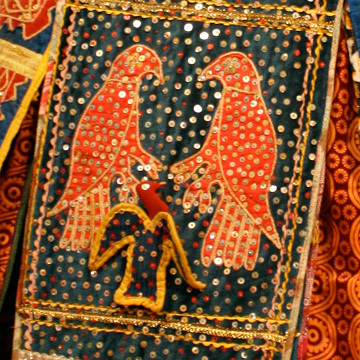 Like a quilt made by hand and handed down within a family, this costume was sewn by hand by Yoruba artists and handed down within a family. Each generation had more and more layers of cloth added to it, so that over time it got fuller and fuller and more and more beautiful. Traditions like the sewing and wearing of this costume unite families and make communities strong. Family structure and the roles of its members are the foundations upon which strong communities are built. What about communities in the United States? How has family structure changed in communities across America? Before there were many extended families, with parents and children living together with grandparents and uncles and aunts. Today, families are structured in many different ways and on average have fewer children. While the structure of the family has changed, have the roles of family members changed too? In many families, the roles of men and women have changed. Over the past several decades, some men have taken on greater responsibility for raising children. And in the workplace, many women are now employed in the same professions as men and together with men help provide for themselves and their families. Would you like to see the Egungun Costume in person? All you have to do is visit the North Carolina Museum of Art in Raleigh, North Carolina. 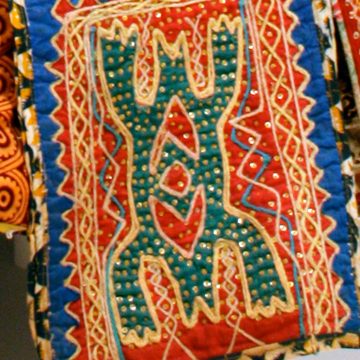 The Egungun Costume is in the African galleries at the museum. Or perhaps you would like a tour. Tours of the collection are given daily, except for Monday when the museum is closed to the public. If you prefer, you can contact the museum ahead of time and arrange for you and your friends to have a private tour. I’m sure a docent at the museum would be happy to show you and your friends the Egungun Costume and many other works of art. Whether you visit the museum on your own or have a tour with a docent, it will be well worth your time!